Echo Moiré (since 2011) by Matteo Marangoni is an exploration of space, sound, and movement in the form of a robotic opera ballet. Two sonic vehicles drive around the space. 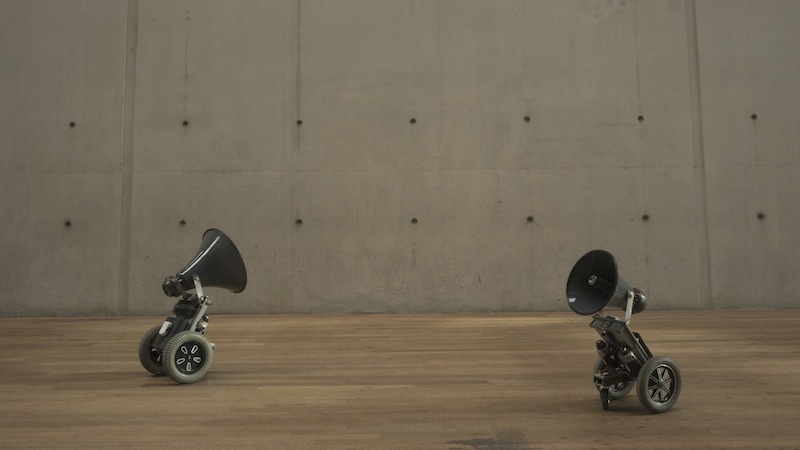 These two robots perform a sophisticated choreography, gradually investigating the audible responses of the room and creating complex patterns of acoustic reflections. The title Echo Moiré refers to these patterns, in the visual domain called Moiré patterns. These patterns occur by overlaying two images containing black-and-white stripes or other motifs. 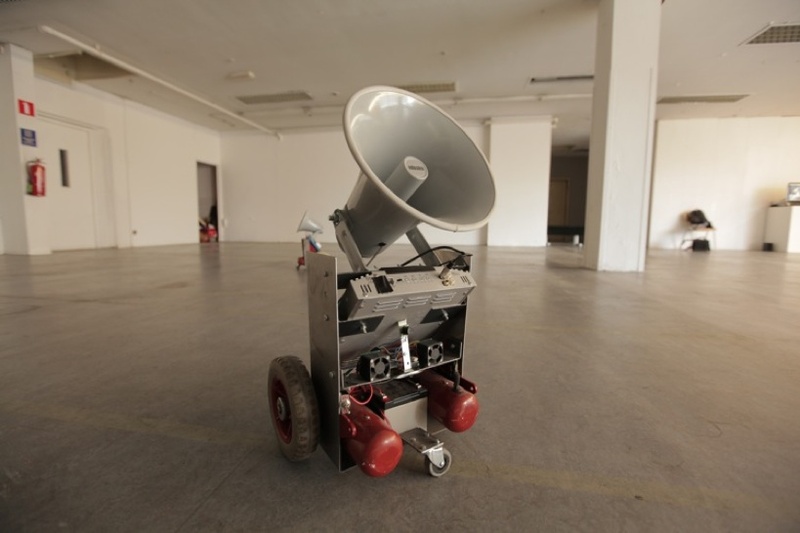 To create sonic patterns manipulated by the acoustics of the space, Matteo used two vehicles emitting sound to create similar phenomena in the audible domain. Simply said, these vehicles are loudspeaker horns on wheels. These speaker horns diffuse the sound very directionally and are therefore very suitable for discovering and playing the acoustic qualities of a space. He made three different sizes of them. The smallest ones (see pictures below) were prototypes and are not used any more. The medium and big sonic vehicles both perform, depending on the size of the space; the larger pair is used for the larger space and the medium pair for smaller spaces. Just as you need a bigger PA for a larger room, you need a larger and quicker robot to play a larger room. 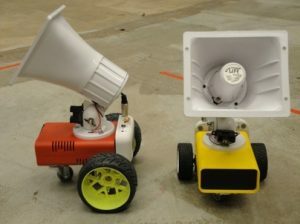 The larger pair of robots has different horn sizes, one horn being slightly larger than the other, which results in slightly different resonances. The robots are built with speaker horns, small audio amplifiers, geared motors, wheels, and batteries. Since the horns are very energy efficient, only a relatively small amplifier and battery is needed for a loud result. An arduino board with dedicated motor controllers and encoders controls the wheel movements. The Sense/Stage system developed by Marije Baalman is used to connect the arduino wireless to a computer. The audio is transmitted wireless as well, and from the same computer, which makes it possible to perfectly synchronise movement and sound of the robots. The whole performance is played by Matteo in real time from this computer using midi controllers. The movements and sounds created by the sonic vehicles are all programmed in the music software Max. The choreography and composition have “fixed overall structure, but it is always adapted to the space; the robots play the architecture, so it’s never the same in two different places.” All movements and sounds are composed for each other and therefore inseparable. The sonic vehicles play the space. As Matteo explains: “the sound I send out from the loudspeaker is not very interesting at all; what makes it interesting is the interaction with the space. In the first 5 minutes I am just basically scanning the room with one rotation, listening to how the sound changes based on the direction of the speaker. I then adjust the sound that I am emitting to highlight certain characteristics of this sound-movement interaction.” The starting point for this seems to be Matteo’s interest in sonic reflections in spaces, and how audible features can trigger new types of awareness: “I find great pleasure and amazement in listening to how sounds echo in the open spaces of a city, or how gradually scanning the acoustics of a completely dark, silent, and reverberant room can open up a totally new way of perceiving a space” (as he explains in this interview on his work by DIGICULT). The video below of the complete choreography of the performance (20 times sped up) gives a good impression of how carefully staged the performance is. In contrast, for example, to driving vehicles, like toy cars, these really seem to know where they are going and create a real ballet (look at the virtuosic pirouettes at the end!). Evidently, Echo Moiré can only be experienced by being there, sharing space with the robots and especially discovering by ear what would not be audible without them. 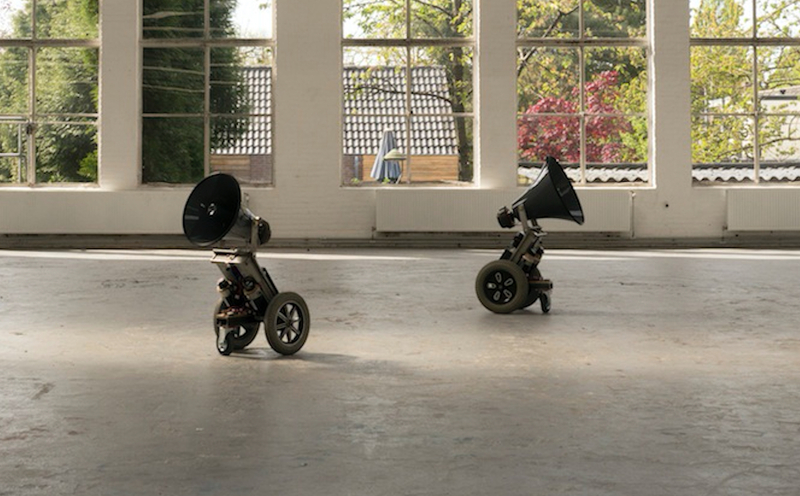 During their performance, the robots open up our ears and make them extremely sensitive to sonic phenomena of resonance and echo in the performance space. As an audience member, the composition guides you through beautiful ways of using your ears, which are not only very different from how we use them in our everyday life, but can also only occur in this purposely designed situation. Thank you, Matteo, for answering my questions!